This extravagent 14ct Vanilla Gold ring features a Chocolate Diamond center stone surrounded by a halo with Vanilla Diamonds and Chocolate Diamond shoulders. This ring is the epitome of lavish jewellery. 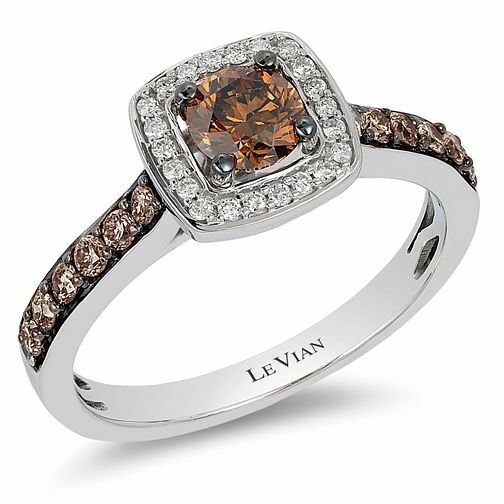 Le Vian 14ct Vanilla Gold Chocolate & Vanilla Diamond ring is rated 5.0 out of 5 by 2. Rated 5 out of 5 by Anonymous from Absolutely stunning! Absolutely stunning! Beautiful quality and definite wow factor!